Last year was a really busy year for me as I traveled more than I ever did throughout my entire life. For a non working full time housewife, I considered myself lucky and blessed to have the luxury of traveling to lots of beautiful holiday destinations and shopping freely without having to worry about my other half's restraint. Ironically, the desire to shop for luxury goods and traveling no longer appeal to me but rather, I started to enjoy the simplicity of life and having less. I begin to relish in the freedom of lesser attachments. Ultimately, when the day comes we would still depart this world empty handed, like the way we arrived when we were born. With that realization in mind, I slowly learned to let go of the years of accumulated negative emotional feelings which I willingly trapped myself into. Once I change my perception of people, seeing the goodness in each person rather than through the lens of my ego, I begin to feel less agitated and are at peace finally. There are still so many wonderful truth to unfold and beautiful people to meet. No matter how bad a person is, there is still goodness in them. 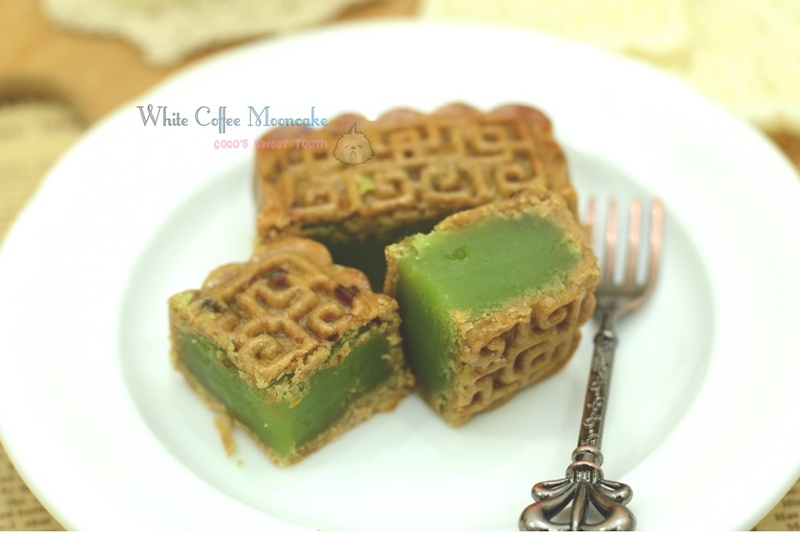 Anyway, back to the subject of this recipe, traditional mooncake. 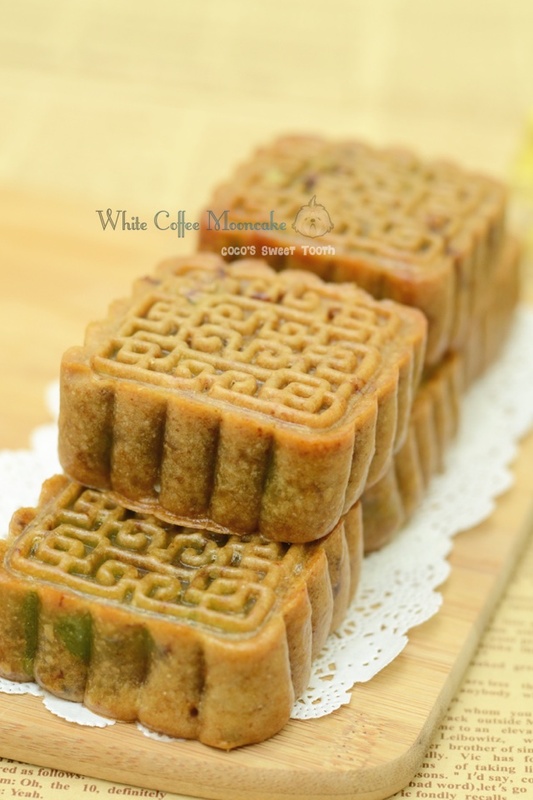 Two weeks ago, I found a packet of green bean lotus paste among my baking supplies which was intentionally bought for the making of mooncake last year. Obviously I was too busy and not around during that time to make good the packet of lotus paste. Instead of waiting for the arrival of this year's mooncake festival, I launched into a pre-festive baking mood to revisit the making of home made mooncake. While making the skin/ crust, I discovered that corn syrup can also be used to in place of the golden syrup which is a stipulated active ingredient. It wasn't deliberate but I was late to notice the depleting state of the golden syrup at home and I was already in the midst of preparation. Thankfully, the corn syrup also helps to bind the flour intact for the fillings and shaping. The use of 3-in-1 instant white coffee mix was a deliberate move as I wanted to enhance the flavor of the mooncake. As for the salted egg yolks, I had to buy the raw preserved salted eggs and remove the yolk and steam it together with some soy sauce and sesame oil for 10mins. Another precious lesson learnt through youtube on how to cook and prepare the salted egg yolks. Combine all ingredients (A) and mix to form a smooth dough. Cover with cling wrap and chill in the fridge for 2 days. 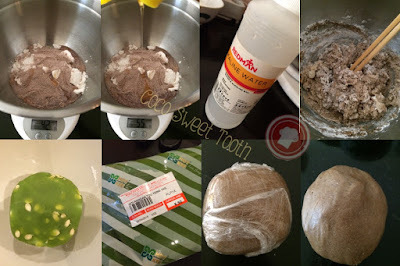 Mix melon seed with lotus paste (B) until even. Divide filling into 75-80g each and shape them round. Set aside. Dust work table with flour. 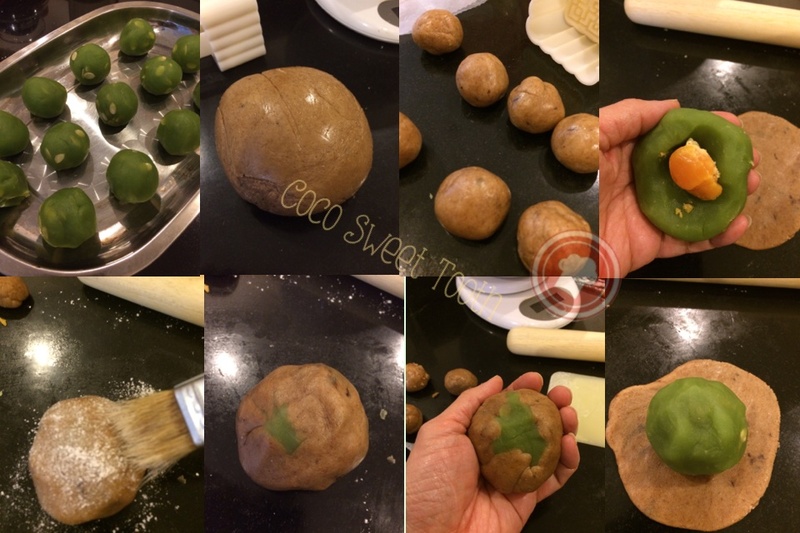 Divide dough into 35g each and shape them into round balls. Flatten dough and place filling onto center of dough. Wrap dough over the filling and shape into round ball. 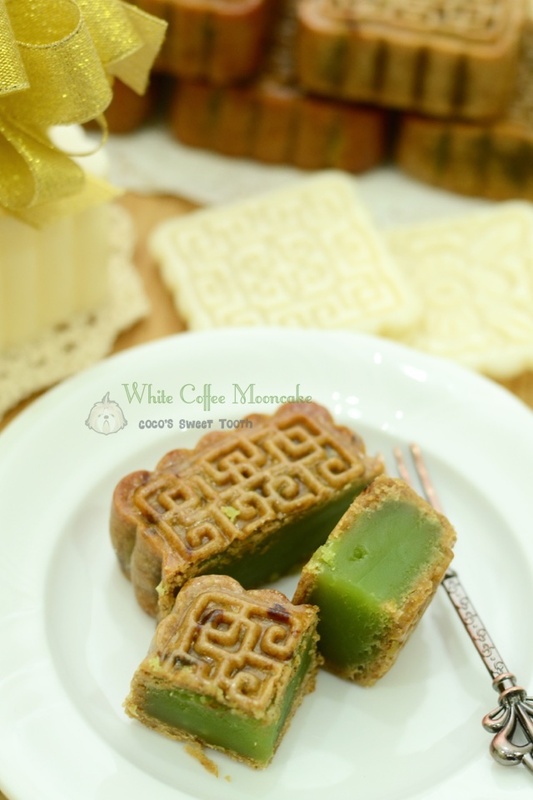 Dust some flour into the 6cmx6cmx3.5cmH square mooncake mould as well as coat the wrapped rounded dough with flour. 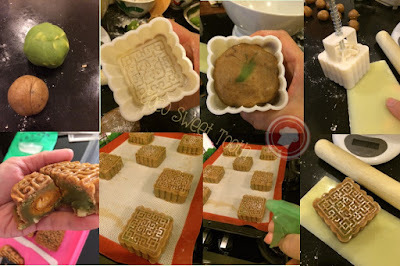 Firmly press the ball into the mould and gently knock / press out (depending on the type of mould you use) the mooncake and place them on the tray laced with preferably, non stick baking mat or parchment paper. Lightly spray sprinkles of water onto the mooncakes before baking. Bake in a preheated oven of 175C degrees for 10 minutes. Remove the baking tray from oven and allow the mooncakes to cool completely between 10-15 minutes before applying egg wash onto the top. 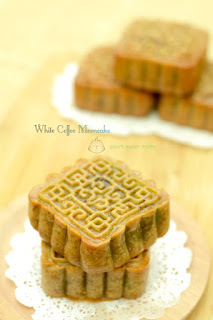 Transfer the mooncakes back into the oven and bake again for another 13-15 mins until golden brown. Store the mooncakes in a air tight container for minimum 2 days for 回油 mooncakes to soften before serving. Do link back to Coco Sweet Tooth if you have used any information as published in this blog. Yes indeed the prices of mooncakes these days somehow seem overly inflated considering the actual preparation work involved. If one compared against the chinese dumplings 粽子, then the latter deserves the price hike justification as its more labor intensive and longer preparation plus cooking time. If you ask me, I would rather spend RM6.00 (what I paid for last week from the vendor) on the chinese dumpling than payment RM10-20 on mooncake. Especially when I am vegan and my maid muslim, its just too much hassle to put all the time to make several dumplings. 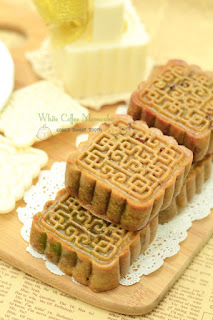 I totally agree with you the best ones are still the lotus paste and tau sar mooncakes. 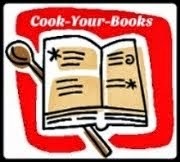 Have a great day and thanks for giving inspirations to many our there with your wonderful recipes. Follow Lady's board Food Photography on Pinterest. All photographs and written posts contents featured at Coco Sweet Tooth solely belongs to cocosweettooth.blogspot.com, or unless otherwise stated. Any party interested to use any photographs or contents, either full or partial, or intended for a repost, please request for prior permission. If request is approved, please give full credit and post a link direct to this site. Please do not change, alter or amend any contents without prior consent.